Indian e-commerce giant's three-day festival offers discounts on select devices from the Korean manufacturer, including TVs and other appliances. Samsung fans rejoice! 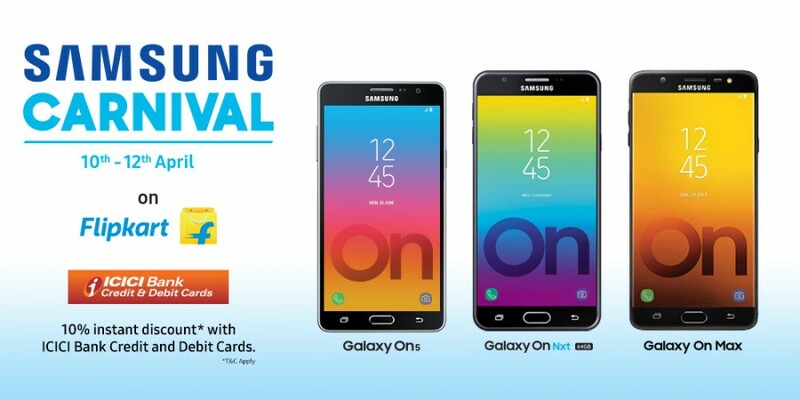 Indian e-commerce giant Flipkart has announced a three day "Samsung Carnival" with heavy discounts on Samsung smartphones and appliances. This time the carnival will run from June 12 to 15. "All efforts and initiatives at Samsung are channelised towards bringing forth products and services that will delight our customers," said Sandeep Singh Arora, Vice President, Online Business, Samsung India. Samsung's flagship smartphones, Galaxy S8+ and S8 will be available for Rs 43,990 and Rs 37,990, offering discounts of Rs. 10,000 and Rs. 12,000 during the period. The entry-level Samsung Galaxy On Nxt will be available for Rs. 10,900 (64GB) and Rs. 9,990 (16GB), offering discounts of Rs 7,000 and Rs 2,009 respectively. With an Rs. 9,000 discount, shoppers can get the Samsung Galaxy S7(32GB0 for Rs. 32,900. Almost all other Samsung smartphones will be available at a discounted price. Flipkart has also opened the offer for Samsung's home appliances, with a wide variety of discounts on TV's, AC's. refrigerators and washing machines with a no-cost EMI on certain products. Other electronics such as Samsung tablets, power banks, wearables and audio equipment are available on discount as part of the carnival. Will Baahubali actress Anushka Shetty appear on Weekend with Ramesh 4?